To the average reader, I probably appear to have the attention span of a gnat. One week I post pictures of a green silk quilt I am quilting. Another week there are photos of a different quilt. Truth be told, I operate best when there is a variety of things to do. I typically have 3-4 quilts in the works at once...one is in the design phase, one is partially quilted, one is probably sitting on a table mostly quilted (awaiting some pick out and contemplation, and another being hand stitched. This one is two evenings from being a completed top (unless I decide on some embroidery, but probably not!). It only lacks 12 silk dots being hand appliqued. It is planned to finish at about 80", as I want to have another quilt that can go into the largest category. Big Bertha has a limited number of shows, and she needs a replacement for sometime next year. Furthermore, I made 25 of those hand stitched hexagon blocks, and by goodness, I was going to use all of them! It is busy, but I am OK with the business. It is different enough in color, fabric and design choices so I think it will look great quilted. I say that without much of a plan for the quilting yet! The hardest area I think is this 11" wide border. It will have a scalloped edge, which I have already marked. Since I already have ideas for the center and silk sections, I am focusing my energy on the green outer border. My first step was to print out a picture, which is faded out a little (this helps me to see when I write on it!). This picture is only 8-1/2"x11" paper. I just started sketching some thoughts I had for the quilting. At this point I have no idea what will fit, what will be marked, etc. I just want to identify motifs that will combine nicely in this space. It is wide, so I will need several ideas. The other key thing is keeping with the theme of the quilt. The hexie blocks are made from Kaffe, Philip Jacobs and Brandon Mably (and others) large scale floral prints. The fussy-cutting of the pieces makes them look very flowerlike, so I want to maintain this flower motif throughout areas of the quilt. The deep green silk (happens to be matching the border green perfectly) dots I have appliqued on the border will be the centers for the flowers on the border. One thing I have run amuck with previously is that I overdesign the quilt via computer, and then have all the details so completely small that I cannot possibly quilt them on the actual quilt. So, once I have a basic concept for the quilting that I like, I either use tracing paper and sketch the quilting on it (at actual size), or do what I did this time -- I printed out the photo of the border at actual size. I had about 6 pages that needed taping together, but whatever. It is only a guide. It's sole purpose is to tell me if this design will look good, and how to mark it to quilt. I pulled out my curved cross-hatch rulers and a couple circles and started sketching. I have an idea how to minimally mark this as I go. Nothing is so complex that I need marking prior to loading. The silk will be a different story. This green fabric is tougher to mark because of the deepness of it. I will use a sharp chalk-pencil, and a blue pen on the silk applique. The ribbons that connect from flower-to-flower will probably be created from a cereal box, and marked as I go. As always with designs, I hope that I will like it. I hope that I choose the right threads. Those crazy nerved will kick in soon enough...as I probably won't start this for 6-8 weeks. I have some very patient clients' quilts to get done now that school is back in session! This is the cover of the current edition of Machine Quilting Unlimited magazine. 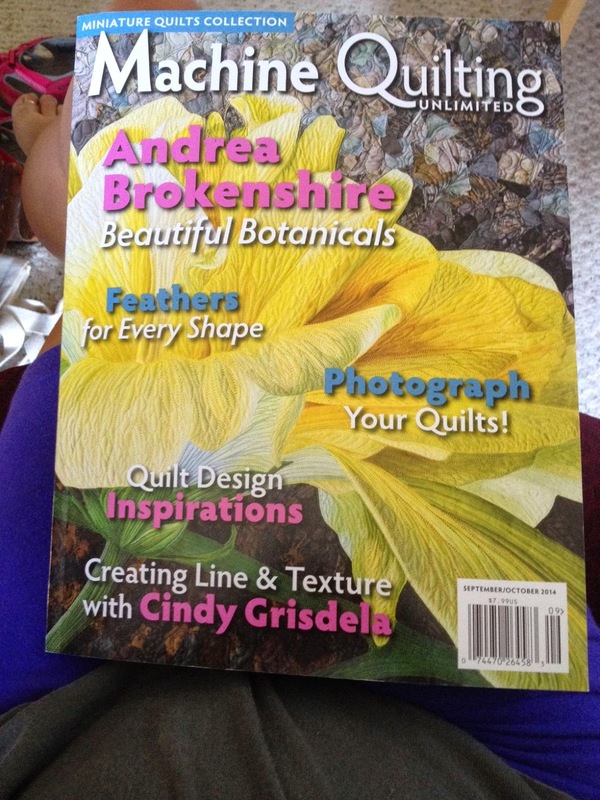 It is the only magazine dedicated to techniques for machine quilters. It always features wonderful how-to articles on topics ranging from quilting techniques to machine maintenance. The quality of the photos and product are truly unmatched in the industry. And, I happen to be a technical contributor to the magazine this year as well as next year! This is my unsolicited toot for the magazine...if you don't subscribe, then you should. It has awesome content for both longarm and DSM quilters. The quilt on the cover is by my quilting friend Andrea Brokenshire. She was at MQX this April with her truly amazing collection of botanical quilts. They are painted silk wall hangings of all flowers. She has a feature in this edition with a ton of lovely shots. And, since the magazine has gone to print, I can now share a small piece I did for my article which is entitled "Finding Your Feather". I have many, many sketches of feather variations for a variety of common shapes. But since I feel like the first page of every article needs some nice eye-candy, I squeezed this into my crazy days. It's only about 18" square, and completely feathered. My scrap batiks in pastel shades make for a lovely future Easter quilt for my table. I will also use it as a teaching sample next year. Oh, did I say that??! Yes, the cat is out of the bag now. I am contracted to teach 4 classes next April at MQX in Manchester, NH. Three are hand's on longarm classes, and one is on (you guessed it...) Feathers! Getting ready for this is a little daunting, because I know that the client quilts are just about to go crazy. My clients always know when my kids return to school! But please, don't let this deter you if you have a quilt to be quilted...somehow I always get them all done. Here's a couple of details...Mostly this was just a fun piece to find different ways to feather with traditional feathers. We all make these very basic and common stars, afterall! I have been puttering with this quilt off and on for nearly a week. The first few days seemed to be going well, but as usually happens, last Friday, I hit a wall. I was making mistakes, quilting things I didn't like and second guessing things I had already stitched. It is currently stabilized enough to remove, which I need to do so I can get onto some client work. I may give myself another day to finish this diamond border though. In the same deep green silk thread, I have added 1/8" fill to pop the diamonds. They definitely pop, but they are too large to just leave by them selves. The interior needs some quilting. Another view...at the corner which seems to have mysteriously morphed from a nice square unit. This causes me consternation. I know that it started very squarely, and hope that a good final blocking will restore that. The last step in this diamond border is to echo the diamond 1/4" inside, and fill it densely. This is the same filler I used on other diamonds on the quilt. Of course <> I wish I had gone a slightly larger echo, like 3/8". Oh well, this isn't coming out. I do have some dense mess to remove, but this hasn't surpassed my "I must remove" threshold. Currently, one corner is done, one is up to the point of the previous photo, and the other two just have the frame stitched. Right now, I have gotten frustrated with my design. I may well remove it from the frame and LOVE it; this does sometimes happen. But I need a break. I have been working on this and my silk ivory wholecloth simultaneously, as that one needs to be finished in about a month if I am to enter it at Road to California. It is growing on me a lot as it progresses. I will leave you with a look at the center of this quilt. I am not extremely pleased with the quilting on the pink. I ripped it out once already when I discovered the thread was too dark. The particular design I chose is tricky to get good symmetry. I tried, but I see the boo boos. I really LOVE the center, but the critical skeptic in me is worrying that the center doesn't go with the rest of the quilt. SIGH!...time to move on I guess, let it sit, and let me work on something else. Today was the 2nd day of quilting on my silk quilt, undisturbed. The photos I took today are a bit discombobulated in that I worked on a variety of areas simultaneously. This makes it a bit harder to discuss areas easily. But...perhaps if I show you a sketch of how I initially envisioned the quilting to be, this will be easier. 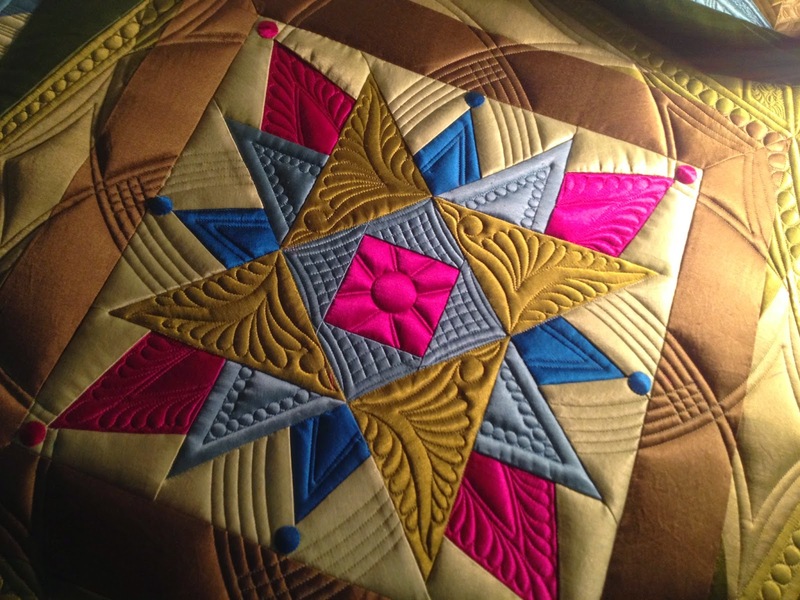 If you have followed my blog, you have seen some of the many ways I design quilting. I have showed sketches like this, drawn in pencil. I have also done ones on tracing paper, which are often done to size and used with a light-box to transfer designs. I also draw on electronic images using a Bamboo-pen tablet. All work well, and allow you to visualize the plan. The quilting for this particular quilt was designed the cave-man method...pencil on printed photo. This is often my mode of choice if I want to design on the go. 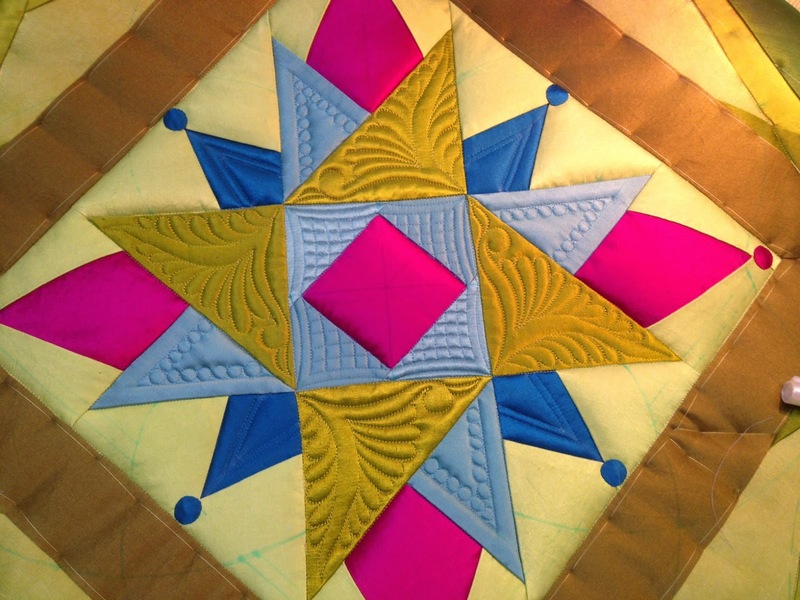 This is only the center of the quilt, but it shows how I hope to transform a pieced star in square set on point, to a jazzy star, in an octagon setting! The quilt is flamboyant in it's use of the pink and blue. I want the quilting of the star to represent this. I have the points in each color designed slightly differently, but they are all styles of quilting that you will see repeated in other places in the quilt, thereby making them cohesive. First step...the larger green triangles. They have this fun little swirly shaped spine for the feathers. In order to make the template, I used a technique similar to what I showed yesterday. I traced the actual quilt, and drew the shape I wanted. It was then transferred to a piece of cardboard for tracing onto the quilt. Here's the end result. The actual triangle is also ditch stitched, as all of the star points will be before it is finished. Another thing that is important to do is to baste the seam lines that you really need/want to maintain straight. I hadn't yet ditch stitched the pale green background to the deeper olive border, but it is basted to eliminate any shifting. It may seem like overkill, but it saves me more times. The blue triangles were next. As it turns out, I deviated from my original plan slightly, in that I omitted the 1/8" striping I thought I might quilt inside of the pebbles. That's OK...it happens ALL the time. The best laid plans are only that...plans. I got this much of the quilting done, and decided I really liked the positive space created without the stripes. It gives the eyes a place to rest. Besides, it is much easier to add the quilting later than to remove it! In the same color thread, I also did the center with some kicking 1/4" cross-hatching. It went in flawlessly too, which is an added plus when adjacent sections align so easily! The dark blue points were done next. It makes me nervous to ditch in a deep color, with a pale background, but this had to be done. I also had to mark the block in something other than my fall-back blue and purple marking pens. For this, I used a piece of chalk. It is the refill to my Bohin chalk pencil,and is nice and sharp. Never use the colors, as they may contain a wax which can be hard to remove. I have heard horror stories from quilters about the yellow and green, but white is JUST chalk and is perfect. I have marked a centerline and a couple other key places. This motif is simpler, which is just fine. The eye is allowed to bounce all over from the larger and busier green feathered triangles, to the pebbled blue triangles, and back to the more grounding blue points. I can't stress enough that a quilt must have a means to draw the viewer's eye to the center, and then have reasons why it keeps coming back to the center (aka repeat of patterns throughout the quilting). Count the repeated motifs...swirls (I showed this in yesterday's quilting), pebbles, cross-hatching. I'm going to end it here for today. I have gone beyond this point with the quilting, but it is a discussion for another day! 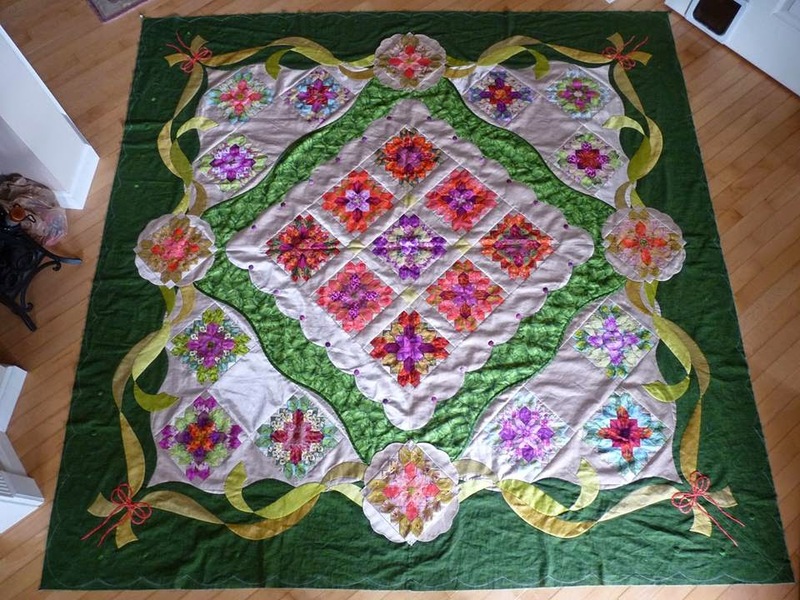 I have started to quilt the 40" green silk quilt I showed in my last post. My kids are away three days this week, and though I don't expect to finish the quilting, I do hope to get large areas finished, and the remainder of it stabilized enough to safely remove it from the frame before Monday. Today I have quilted these 4 blue-green corners. I thought it might be helpful to some to understand my process during the quilting. Now, I have already designed what I plan to quilt. This post is about how on earth I implement the quilting. Some days, even I wonder how that will occur! Let's backtrack through each stage of this quilting, starting even before this point. Below, you see the bare space, unquilted. I have stabilized the blue-green interface with basting stitches so that it remains nice and straight. What I don't want is a stitched line there, as that will cut straight through my motifs. The swirly frame that is drawn on the silk in blue marker was created and marked prior to loading the quilt. I used tracing paper, and sketched the design I wanted. Tracing paper allows me to audition the design with the quilt showing through. I then created a cardboard (using a manila folder) template of this shape, and sketched it onto all 4 corners. This shape is the "bare bones" or frame of the design, so it is the first to be stitched. For those curious, this quilt is hand-dyed silk Radiance, the thread is 100wt silk, and I have double-batted with Hobbs 80/20 and wool. I do use my curved templates when necessary to stitch nice neat curves. The longer curves can be harder to stitch purely free-hand. Since my machine is NOT computerized, I use whatever tools I have at my disposal to create neat stitching. Templates are like my second skin...I have close to 50 of them! These 90 degree lines were marked next. They are spaced 1/2" apart. Next I stitch the feather sprays. The smaller ones on the outside are pretty simple, and all I mark is an external boundary. The larger ones at he center must be somewhat marked so that they end up symmetrical. To begin, I stitch one of them. What I need to do next is make a pattern from the feathers I just stitched. I took a piece of Press-n-Seal, placed it over the feathers. I then trace them with a sharpie pen, very carefully and gently. To press too hard would be a frustrating disaster! Next, press the piece of Press-n-Seal onto a piece of cardboard. I cut mine from an empty Cheese-It box. Nothing goes wasted in our house! Now, cut out the pattern. I left the curves of the feathers as a reference. If I can follow the feathers and match to the ones on the other side, then great. If not, that is fine too. This is free-hand quilting, and I don't expect my work to look like a machine did it. I just expect clean quilting and creativity. Trace the boundary of the template, and quilt! Looks pretty good to me, and if you can stare at it from 12" and think that, imagine what it will look like on a wall! From here, creating a fun design is all about utilizing different, yet cohesive, design elements in your spaces. I stitched these chevrons, alternatively filling each space. This makes the other (or positive) pop out. I also decided mid-quilting that I wanted those 1/4" circles on the apexes of the chevrons. Some design elements do actually come after quilting has started. I don't always plan every element apriori. I know that I will use parallel like work on this quilt too, and this is an area that you can use several different styles simultaneously (ie., 1/8" spaced, 1/4" spaced, and any other variation) and still obtain design cohesion. This time I chose a 1/4" spacing, with every other space filled with 1/16" lines. The blue area has not been stitched because that will actually be quilted with a blue thread, maybe tomorrow (and I really don't know what is going there!!). FYI...these corners are about 10" on the short side (blue), and it took me about 4 hours to quilt all 4 of them! I am kind of neurotic about being neat, which is slow, and all stops and starts are knotted and buried. I have been quilting some this summer, but believe it or not, I have done 4 quilts for a client writing a book which I have to wait an entire year to show! That hasn't left too much to share here. I also thought I had pictures from Quilt Odyssey that might have been nice, but they are embedded on my stupid iphone that refuses to sync with the computer. Somehow emailing them to myself is just too much to do! This quilt was finished last month before we went on vacation. It's on the order of 56-60". The bright solids are just cotton batiks, while the dark fabrics (which there are actually several fabrics ranging from deep navy to black) are a rather heavy broadcloth. This fabric was challenging at times to get to lay flat, but the client is happy none the less. The dark background is quilted with a couple of colors of thread...honestly it has been 2-3 weeks and I have forgotten. I think part of it is a variegated blue/purple and the rest is in black or deep blue. I do remember that I originally planned to do some curved cross-hatching in the background but because of the bulky seam intersections, it was difficult and was abandoned. Free-motioning worked just fine though. All points are ditched with clear thread so that the points stay crisp.